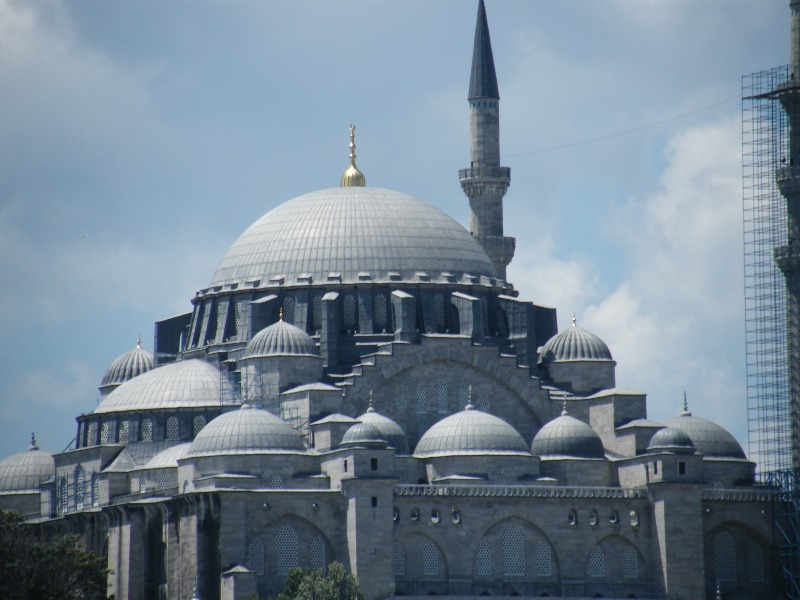 In a programme broadcasted on BBC Radio 3 on Sunday 14 February 2010, the work and influence of the great Ottoman architect Mimar Sinan was highlighted, through the description of his magnificent buildings in Istanbul and its influence on Italian Renaissance architecture. We here present a link to this programme for online listening, with further resources. Sinan the Magnificent: BBC Radio 3 Programme, Sunday 14 February 2010, presented by Jonathan Glancey. 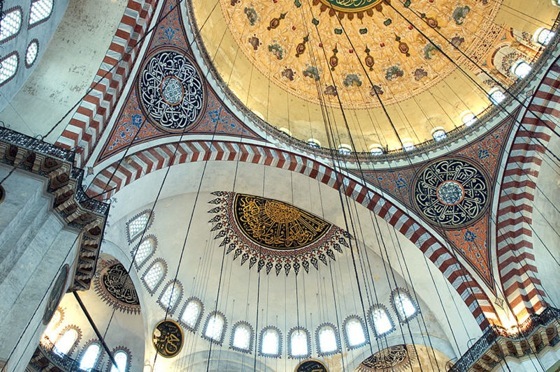 In a programme presented by Jonathan Glancey, architecture correspondent for the Guardian, and broadcast on BBC Radio 3 on Sunday 14 February 2010, the work and influence of the great Ottoman architect Mimar Sinan (ca. 1490-1588) was highlighted, through the description of his magnificent buildings in Istanbul and its influence on Italian Renaissance architecture. The extent to which the great Ottoman Empire influenced the rest of Europe can still be seen from the buildings it has left behind, explains architecture and design expert Jonathan Glancey. Driving throughout Istanbul, he marvels at the innumerable construction works and wonders whether the built-up area will ever stop, if it will go all the way to the Balkans, Greece and Italy? The link is easily made when one recalls the influence of Ottoman architecture, especially that exerted by Sinan in the 16th century on Renaissance Italy. Sinan was a contemporary of Michelangelo and Andrea Palladio, two of the most influential Italian architects, and the traces of his designs can be found in some of their works. However, his is at present little known in the West. Yet not only did Sinan shape some of the world's finest buildings, such as the Suleymaniye Mosque in Istanbul and the Selimiye Mosque in Edirne, his work was also to influence that of the most ambitious architects of the Italian Renaissance, as theirs was to affect his. Figure 1: The Suleymaniye Mosque Complex in Istanbul is one of the greatest Ottoman architectural achievements. Located on the second Hill of Istanbul, it is the second largest mosque in the city and one of the best-known sights of Istanbul. The Suleymaniye Mosque was built on the order of Sultan Suleiman I by the great Ottoman architect Mimar Sinan between 1550 and 1557. (Source). Besides the various connections in politics, culture and trade between the Ottoman Empire and Renaissance Europe, scholars had documented the mutual architectural influence that existed between these two powers of early modern times. Michelangelo's dome in Rome, was surely influenced by those of Sinan's daring mosques in Istanbul. Equally, it seems possible that Sinan would have seen drawings by the Italians. Palladio's champion and patron, Marcantonio Barbaro, was for six years the Venetian ambassador to Istanbul. 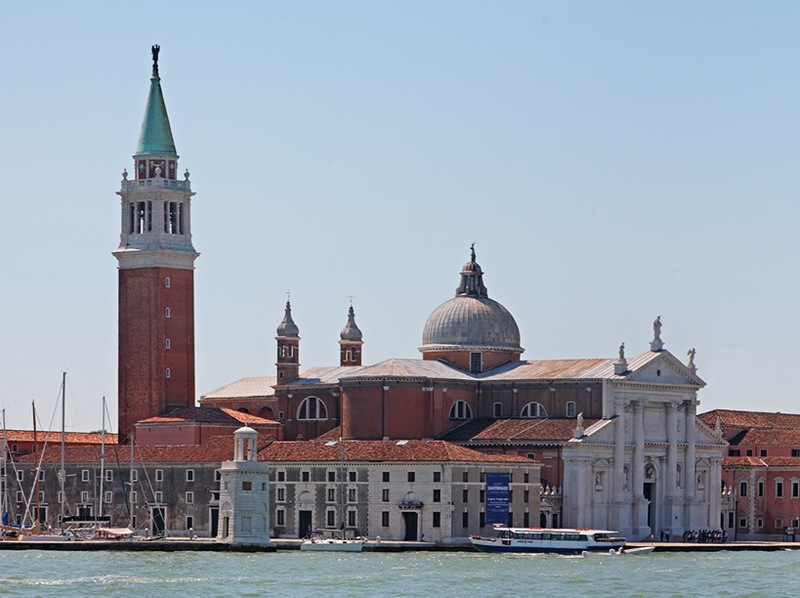 It is quite possible that he made some sort of connection between Sinan and Palladio, the architect of the magnificent Church of St Giorgio Maggiore in Venice. This connection had already been traced by recent scholarship and several publications have shown the multiple aspects of the "Islamic" presence and impact in the culture, art and architecture of Venice in particular, and Italy, in general, in the Middle Ages and early modern period. These works provide the context and the background to any possible impact that Sinan's architecture may have had on Renaissance Italy. Figure 2: Interior dome view of the Suleymaniye Mosque. The main dome is 53 meters high and has a diameter of 26.5 meters. At the time it was built, the dome was the highest in the Ottoman Empire, when measured from sea level. (Source). In her book Venice and the East: The Impact of the Islamic World on Venetian Architecture (1100-1500), Deborah Howard proposes a wide-ranging approach in which the author uncovers and examines the reflections of the Islamic world in Venice between 1100 and 1500, particularly as they appear in architecture and architectural decoration. Going beyond the usual art history publications that establish artistic influence by comparing visual motifs, Howard's concerns go deeper into the consideration of the many possible methods of transmitting ideas about distant places, such as incorporating images into architectural decoration or utilizing civic spaces in unfamiliar ways. Her thorough discussions of the complexity and indefiniteness of these processes turn her book into nothing less than a study of the phenomenon of cultural transmission. There are many sites in Venice featured in Howard's book where Islamic influence can be seen. Examples are not limited to specific architectural forms, but include many types of references that are understood to "emulate" other cities and monuments rather than imitating them. A chapter on San Marco, for example, focuses on references to Egypt, and to Alexandria in particular, in the mosaic decorations as well as including a section on Islamic architectural forms found in the building. Another chapter looks at Venice as a mercantile centre and finds characteristics of the emporia of the Islamic world in both its plan and its buildings. Figure 3: View from Piazza San Marco in Venice of the Church of San Giorgio Maggiore. The basilica was designed by the Italian Renaissance architect Andrea Palladio (1508-1580). Its construction was begun in 1566 and was not entirely finished before his death in 1580. Its design was probably inspired by Sinan's architecture. (Source). The section on Venetian palaces, in addition to a traditional tracking of specific architectural motifs such as ogee arches and mihrab windows, moves beyond the normal scope of art history to consider how such borrowings were perceived by a Venetian audience as signifiers of eastern experiences and social place. The unusual design and decoration of the Palazzo Ducale are shown to allude to the architecture of the Mamluks, as part of imagery meant to establish Venice as the heart of a vast global trading arena. A final chapter explores Venice as part of the pilgrimage route, which placed her in a constant comparative relationship to the Holy Land. The Venetian built environment is seen as emulating sacred locations, rather than directly copying them, until the city became a "flickering mirage" of Jerusalem. In another vein, Stefano Carboni, author of Venice and the Islamic World (828-1797), narrates the passionate story of the links that existed between Venice and the Islamic lands in pre-modern times. From 828 CE, when Venetian merchants carried home from Alexandria the stolen relics of St. Mark, to the fall of the Venetian Republic to Napoleon in 1797, the visual arts in Venice were dramatically influenced by Islamic art. Because of its strategic location on the Mediterranean, Venice had long imported objects from the Near East through channels of trade, and it flourished during this particular period as a commercial, political, and diplomatic hub. This monumental book examines Venice's rise as the "bazaar of Europe" and how and why the city absorbed artistic and cultural ideas that originated in the Islamic world. Venice and the Islamic World features a wide range of fascinating images and objects, including paintings and drawings by familiar Venetian artists such as Bellini, Carpaccio, and Tiepolo; beautiful Persian and Ottoman miniatures; and inlaid metalwork, ceramics, lacquer ware, gilded and enamelled glass, textiles, and carpets made in the Serene Republic and the Mamluk, Ottoman, and Safavid Empires. Together, these exquisite objects illuminate the ways Islamic art inspired Venetian artists, whilst also highlighting Venice's own relationships with its neighbouring region. Fascinating essays by distinguished scholars and conservators offer new historical and technical insights into this unique artistic relationship between East and West. Sinan the Magnificent: BBC Radio 3 Programme, Sunday 14 February 2010 20:00 GMT (aired on BBC Radio 4 on Saturdays, 11:30), presented by Jonathan Glancey, architecture correspondent for the Guardian. Architecture that links East and West (published 13.02.2010). Auld, Sylvia, Renaissance Venice, Islam and Mahmud the Kurd: A Metalworking Enigma, Altajir World of Islam Trust, 2004, 344 pp. Brothers, C., "The Renaissance Reception of the Alhambra: The Letters of Andrea Navagero and the Palace of Charles V", Muqarnas (Brill) vol. 11, 1994, pp. 78-102. Carboni, Stefano, Venice and the Islamic World, 828-1797, Yale University Press, 2007, 375 pages. De Osa, Veronica, Sinan the Turkish Michelangelo, New York: Vantage Press, 1982. FSTC, Remembering the Language of History and Science: When the World Spoke Arabic. FSTC, Bringing to Life the Islamic History of Europe: A Video Documentary. Howard, Deborah, Venice and the East. The Impact of the Islamic World on Venetian Architecture 1100-1500, New Haven, CT: Yale University Press, 2000, 272 pp. Fletcher, Banister; Cruickshank, Dan, Sir Banister Fletcher's a History of Architecture, Architectural Press, 20th edition, 1996 (first published 1896). See Part III. Read online here. Necipoglu, Gülru, The Age of Sinan, London: Reaktion Press, 2005.